Who Owns Copyright? My Company or Me? >> Who Owns Copyright? My Company or Me? As the author of a creative work, you are the one who owns copyright to it in the first instance. There are two exceptions to this rule. The first is if you are an employee and you created the work as part of your job. In that case, your employer is who owns copyright to the work. The second exception is if you created the work as a work for hire. In that case, the individual or company who hired you to create the work owns the copyright to it. What about when you own the company? Who owns the copyright then? In the case of a single member LLC or a wholly-owned S Corp., the bigger question is not who owns copyright to the creative work, but rather who should own it? Does it make more sense to hold the copyrights as an individual or to transfer copyright ownership to your company? This is a strategic decision. You need to look at why you set up your company in the first place and what you plan to do with your copyrights in order to decide how copyright ownership should be held. 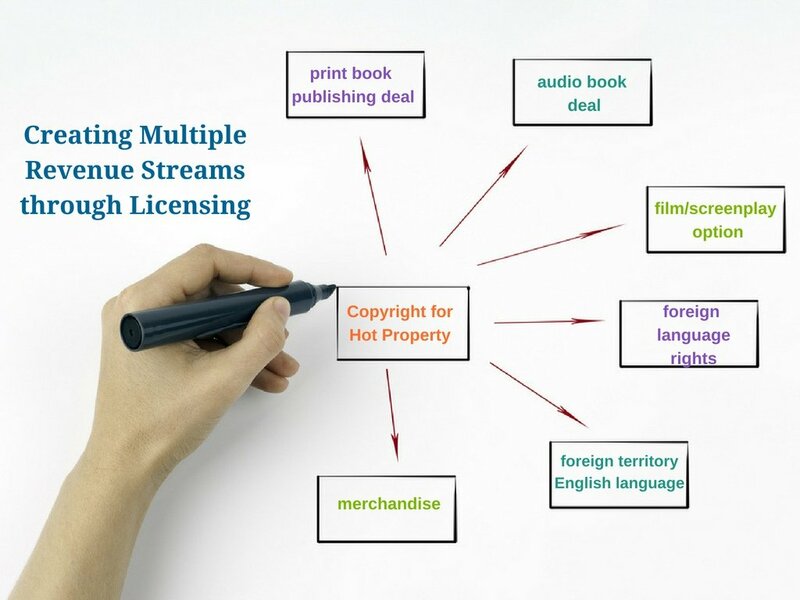 Your copyrights have the potential to be income producing assets generating multiple revenue streams. A writer can license print book rights, audio book rights, foreign language rights, English language in foreign territory rights, and option the work for performance or a screenplay—each to a different entity, for example. Visual artists can license their work to fabric manufacturers, or for wallpaper, for calendars, coffee mugs, any number of consumer products for sale by retail chains, or as backdrops to ad campaigns or video productions. 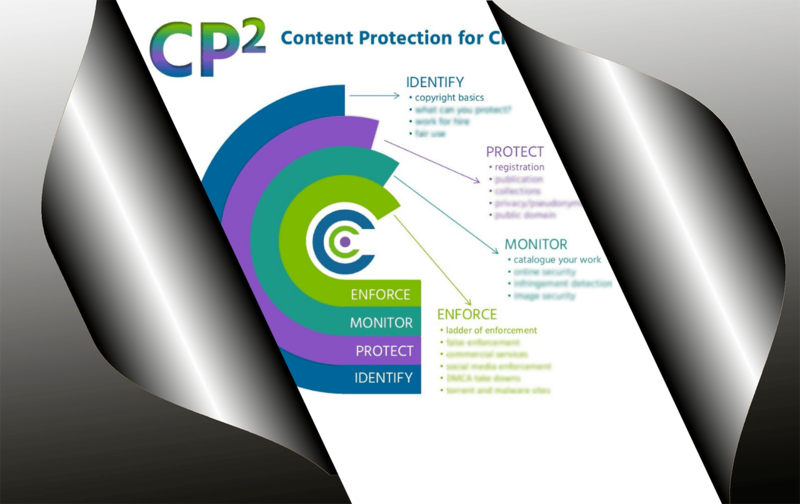 When deciding who owns copyright—whether to keep ownership of your copyrights in your own name or to transfer copyright ownership to your company—you need to assess which option offers greater protection for those income streams. When making the decision about whether you or your company should own your copyrights, you need to consider the risks to which you and your company are exposed. In other words, how could you or your company get sued? Almost all creative professionals—writers (fiction, non-fiction, and memoir), visual artists, filmmakers, musicians, graphic designers—have exposure to claims of infringement by a third party. If you infringe someone else’s creative work, that person is probably going to sue you personally, not your LLC. They may not even know about your LLC and in any event, they think you did the infringing, not your company. Creative professionals can also be sued for defamation, invasion of privacy, or violation of someone's right of publicity. If you signed a contract, you could be liable for breach of contract. Simply put, operating through an LLC will not save you from being sued personally. Your company could get sued for exactly the same things. The primary purpose of operating through a business entity is to protect yourself and your personal assets from liability. After all, LLC means limited liability company. If there is a judgment against the LLC (or an S Corp.), the creditor has recourse against the assets of the company. But the creditor can’t get to your personal assets. Copyrights owned by the company could be exposed to claims by the company’s creditors. On the other hand, if you hold your copyrights as a personal asset, they could be exposed to your personal creditors. For instance, Toni Braxton filed for personal bankruptcy and lost the copyrights to her portfolio of songs. Your membership interest in the LLC (or your shares in an S Corp.) is a personal asset. But it is a personal asset that comes with another layer of protection. In most states, creditors cannot directly attach the assets of the LLC or an S Corp. to enforce a personal debt. Instead, the creditor can get a charging order which entitles them to the member's distributions from the LLC. This is a state law issue. Some states are more debtor friendly than others; plus, the answer may be different for single member LLCs. Because in most states creditors cannot directly attach the assets of the LLC or an S Corp. to enforce a personal debt, it is easier to protect the revenue streams generated by your creative work if your copyrights are held by your company. Your personal creditor may get to the revenue itself, but not to the creative work that generates the revenue. Once the debt or judgment is paid, you still own the income generating asset—the copyright. Apply for copyright registration on your work and identify yourself as the author and initial claimant. Then make an assignment of copyright to your company in which you "sell, assign, transfer, and set over to [your company] the entire United States, foreign and international right, title, and interest in and to copyrights, copyright registrations or applications pertaining to [the work]." The transfer or assignment document can be filed with the Copyright Office. The transfer is effective even if the document is not filed with the Copyright Office. You can name your company in the rights and permissions section of the application. You can do this even if you decide not to transfer your copyrights. This manages the expectations of potential licensees—that they are dealing with a company and not an individual. Listing your company as the rights and permissions manager of your copyright helps to manage expectations of potential licensees—that they are dealing with a company and not an individual. The current term of copyright is the life of the author plus 70 years. If the author is a company, the duration of the copyright is 95 years from publication. With the approach suggested here, the math favors a creator who lives 25 years or more from publication. Depending on your age, your estate will have a longer period of time for controlling and licensing your copyrights with you as the author. There are a number of considerations that go into deciding who owns copyright to your creative work. This post outlines one way of handling the issue. Add salt and pepper to taste. 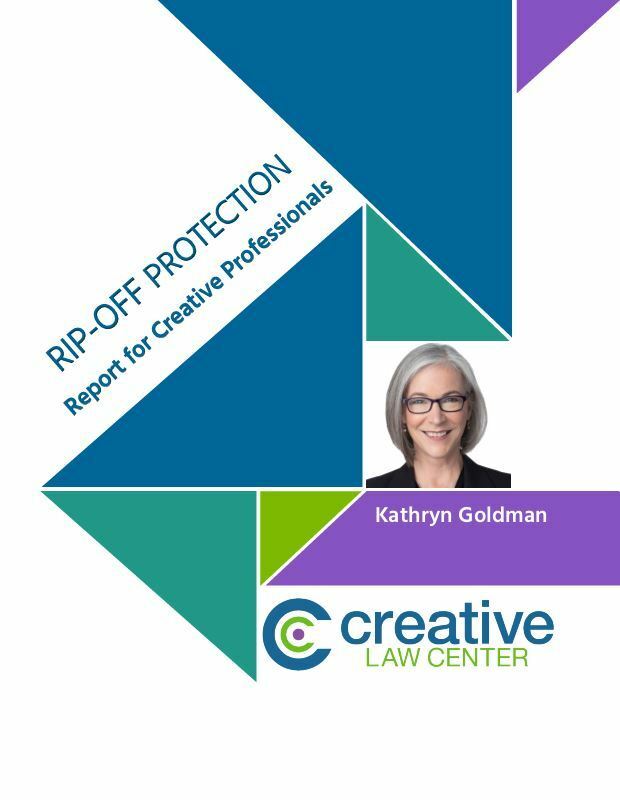 Kathryn Goldman helps artists, writers, and other creative professionals make a living from their art by teaching them how to protect their work and enforce their rights. She is an attorney who writes these posts to help you be more thoughtful about intellectual property and the law when you write your stories, create your art, and build your business. Kathryn, thanks so much for this valuable information. I was hoping you would entertain a follow on question about the creative work itself. When selling the creative work (the object itself) through a single member LLC and copyright remains with the author. What actually gives the LLC the right to transact the sale? With a single member LLC, there’s an implied transfer of the work itself from the creator (the sole member) to the entity. The entity can then sell what it owns, the work. You are correct that the bundle of rights that makes up the copyright stays with the creator in the absence of a written transfer. From a tax perspective, there’s really no issue because of the pass through nature of the entity. Great question. Thanks again for your timely response. One last question if I may. Would that implied ownership constitute “Personal Property” or “Inventory” to the LLC? Are you working on your taxes? I think it’s inventory because the entity intends to sell the work. Personal property is equipment and material the entity uses to run its business . . . like computers and filing cabinets. You should double check that with an accountant. Yes, working on Personal Property Taxes… You have been a great help! I will take your advice and confirm with an accountant and look forward to reading more of your post. Thanks for the info! I am wondering why you would want to first register the copyright to yourself (the individual) as the owner and author and then transfer it to your firm instead of just registering the copyright with the firm as the owner and author from the get go. Is there a difference between the two? I take it the firm owns all the rights at the end of the day either way. The issue is less complicated if we’re talking about a single member LLC and you are the only member. In that case it’s a question of trying to maximize the duration of the copyright. Let’s do the math. Say you’re 50 years old and publish a book today. If you live to be 85 years old, the copyright will last for a total of 105 years. Your heirs will have the benefit of revenues generated by the copyright after your death. If you apply for the copyright in the name of your LLC as the author by a work for hire agreement, that copyright will last for 95 years. There’s an extra 10 years by registering the copyright in your individual name. The numbers are even better for younger authors. Also, the LLC only owns all the rights at the end of the day if you as the individual transfer them in writing. Very helpful information! Thank you. You’re welcome, Welwyn. I’m glad you found it useful. Thank you for this information. I will get on it a.s.a.p. I agree about how good your new website looks. I’d be interested to hear whether you decide to transfer your copyrights to your company, Irene. Your information is so valuable to anyone doing creative work. Great job with the new website, can’t wait to see more! Thanks for reading, Paula. The Creative Law Center gives me the flexibility to offer a broad swath of resources to creative professionals — from copyright protection to business building to trademark and branding guidance. I’m looking forward to developing it in many directions. Thanks so much Kathryn! This is another valuable post. This is an area that definitely needs to be considered, especially since I plan on being a full-time author and having multiple income streams. It gives me a lot to think about. Again, thanks and I’m looking forward to your next post. “Multiple income streams” is one of my favorite phrases. May you have great success with your plan to generate them. Upcoming posts will focus on establishing those revenue streams and protecting them. Thanks for reading, Mary Ann. It’s always good to hear from you. Perfect timing for me as I have been considering these very same concerns for a number of months. As always, Kathryn clarifies issues involved and options to consider. Excellent information from a pro. The self-publishing industry, of which I am a member, is fraught with legal exposures and opportunities in a variety of areas. Advance planning and arranging your business affairs properly will help you: (1) protect your intellectual property rights, (2) protect your personal assets (3) defend against the legal predators which see you as an opportunity, and (4) assure that your estate will survive intact and be there to provide valuable income for those you love. You’re welcome, Thom. There are lots of pieces to building a successful career as a creative professional. Once you lay a solid foundation for your business, it’s easier to work on the fun stuff, the actual creating. An interesting analysis of an issue I’ve never considered. Every case is different, so your mileage may vary, but it’s no less important to think about. It’s true, Karl. Everybody’s situation is a little different. The business structures and protection mechanisms are the same. It’s how they are pieced together that requires some thought. Thanks for the comment. Model Releases: Who Needs Them and When are They Needed?